A Marjoman Horse Leather Show Halter and Leather Lead Rein. Beautiful Quality Show Halter and Lead Rein to really help make your horse stand out in the Show Ring. This beautifully made Leather Show Halter is ergonomically designed to shape to your horses head comfortably without twisting to ensure an optimal fit. The leather lead rein has a trigger style clip fastening with built in chain that means you can detatch the lead rein and chain easily if required. 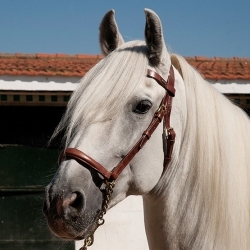 A chin strap can easily be added if needed if the chain and lead rein are removed. Plain browband and matching plain but slightly padded noseband. The show halter will really make your horse stand out when showing inhand. 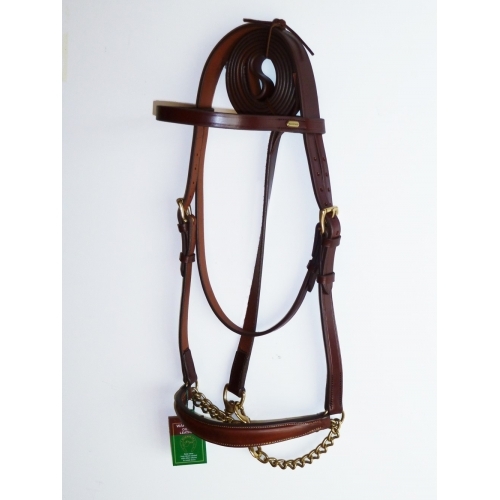 The Leather Show Halter has been specifically designed to enable you to lead / show your horse inhand. The Leather Show Halter is available in the following sizes: There are 2cm either side of the below measurements to punch more holes in the leather headpiece! The Leather Show Halter and Leather Lead Rein are available in the following colours: Please see the additional images! The Leather Show Halter is Made from the Finest Quality Materials but Affordable!